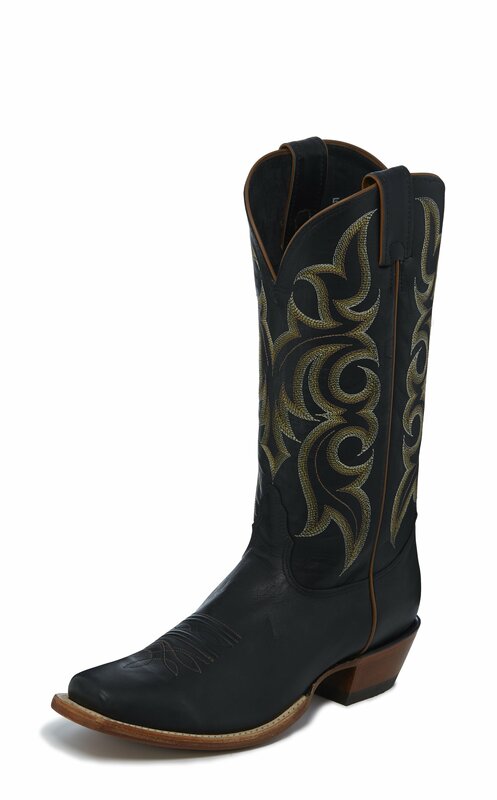 The Brisby Black is a 13-inch tall Men's western boot with effortless class and style. The polished black calf skin leather exterior provides a smooth and clean backdrop to the hombre cream and copper stitching along the upper. The amber seam running down the quarter and along the collar catches the eye and compliments the natural brown outsole. Its single stitch welt offers durability and the cushioned insole guarantees lasting comfort and support throughout the day. This style is proudly Made in the USA with global parts. I bought these boots three years ago... they still fit , feel, and look great! I have been wearing these boots for two weeks now and they are broken in and comfortable. My foot measures size 13 E width and my EE boots are snug on the right foot and a little loose on the left foot, so I just found out my feet are slightly asymmetric. Suggested by Jim at Santa Fe North in Conway,NH. Jim from Santa Fe North brought these out for me to try on. I was not sure as all my other boots are snip toe. I wore them in the store and bought them. I have worn them to work everyday for the past two weeks (15 hours a day) and they are fantastic. The quality of the material and craftsmanship is what I would expect from something at twice the price!The store we bought the boots from is fantastic and I trust Jim and Gina to only carry quality as their reputation is based on customer satisfaction. They nail it! When they suggested this boot it was not something I would have considered but now my daily attire.Totally happy with the product, style, and value! Thank you to the NOCONA company and workers for bringing their processes and product to market! These are the most uncomfortable boots I've ever had. I've had them for months now and they still seem to not break in. I wore them for an entire day and night and had bruises on my ankles. Also the bottoms are incredibly hard, even with insoles. I've even taken them to a cobbler, who put in leather padding on the ankles and an insole, and they still hurt my feet and ankles. It was a mistake to spend so much money on them and now I'm going to try to resell them, probably for a fraction of what I paid. I've owned a few pairs of all the big brands, TL, Ariat, Chippewa, Justin, Redwing. These are by far the most comfortable. I just ordered my second pair, just don't wear them in the rain unless you treat the soles! Same great fit as my first pair. Style and workmanship, sturdy pegged shank, comfortable heel box and consistent sizing keep me coming back. Have four pair in my closet and have the full quill ostrich on my bucket list. Congrats for your "old school" commitment to quality ! I am 70 years old and have worn Nocona Boots as long as I can remember(when they were still made in Nocona, TX). I have a very narrow foot with an even narrower heel and Nocona Boots are the only boots that fit me properly. My only complaint is that they are hard to find in this part of the state and when I do find them no stores carry narrow widths. I love these boots and would sure hate to resort to expensive custom made boots.